Left to themselves, financial markets can create outcomes that are lean and mean, but not always green or inclusive. Charting a course for sustainable finance takes courage and vision, writes the United Nations’ Steven Stone. I must admit, I was pleasantly surprised when I arrived in Singapore last week for the 3rd Asia Pacific Ministerial meetings. Expecting the worst, I had images of fearsome sky-scrapers and privatised nature reserves sitting atop exclusive buildings, which indeed now exist in Singapore. Yet I also found something much more exciting: the legacy of a vision of the city as a garden. Everywhere, trees. Along the road from the airport, along a parkway. Downtown, along every avenue. Coming out of buildings. Everywhere. Trees that were planted ten, twenty, fifty years ago. Redefining, pleasantly, the concept of an urban jungle. And then I realised that this far-sighted vision of the future seems not isolated to making the city a more livable space, but also extends to the financial ecosystem. Though more recently planted, the green shoots were well in evidence. Such as the recent introduction by the Singapore Stock Exchange of mandatory sustainability reporting or their progressive stance on looking at the underlying rules governing asset holdings, via the Network for Greening the Financial System. Our ability to reframe and re-stabilise our climate and our economies will depend on the signals that regulators send to markets and that markets transmit to consumers and investors. This effort, led by the Central Bank of France and including the Monetary Authority of Singapore as well as the Central Bank of China, seeks to align reserve requirements with potential climate liabilities and risks in bank and investor holdings. Another goal is aligning incentives to reflect the social cost of potential liabilities and the threat they may represent to economic and financial stability. In the end, our ability to reframe and re-stabilise our climate and our economies will depend on the signals that regulators send to markets and that markets transmit to consumers and investors. This seems obvious, but there is so much more below the surface. Consider the plastics waste issue that was boiling at the ministerial meetings. In January 2018, China banned the import of plastic waste coming from Europe, which had previously been considered an export of recycled plastic. The value of the “recycled” waste was becoming negative: with all kinds of plastics mixed together, much of it with food waste but more importantly some with toxic chemical compounds, the plastic waste was simply becoming a liability which has now spilled over into the rest of Asia and probably the rest of the world. A minister from Malaysia said at the meeting that in the year 2017 about 500 million tons of secondary plastics arrived on its shores. Last year, after the ban on plastic waste from China, more than 700 million tons arrived just in the first six months of 2018, leading to its own ban on imported plastic waste in November 2018. The point is, the world is now deeply interconnected, and we have gone way beyond the point where a country—any country—can act in isolation from others. We need a common frame of action. In the case of plastic waste, it appears there are proposals afoot to help reform the rules of trade and definitions of what could constitute usable secondary plastic waste, to create both a market internationally for secondary materials and also compel countries to deal with their own waste at origin and thereby contribute to more circular economies at home and around the world. But creating markets takes work, because it depends on having robust rules and institutions behind them to make them work and operate efficiently and transparently. Which brings us back to finance, and ultimately, back to our urban jungles. Because the markets, left to themselves, can create outcomes which are possibly mean and lean, but not always green nor inclusive. It will take vision, and courage, and the same far-sightedness as the planners and builders of Singapore so many years ago and that still resonate and inspire to today. To put finance at the service of sustainability and cities at the service of their inhabitants. To channel and direct our wealth and resources, not into rent-seeking and public good depleting activities and transactions, but back into the real economy and the people and skills that will underpin it. To ensure that, in the words of Mariana Mazzacuto, who argues so well in her new book about the value of everything, we do not confuse how we define and measure those activities that extract wealth as opposed to creating it. And to ensure we have the policies in place to attack a growing concentration of wealth that is potentially damaging to our democracies, to our environment, and to our planet. Mean, lean and green – that means redefining the competitive playing field so that we are all pulling in the same direction. One that increases our wealth and our chances for prosperity. 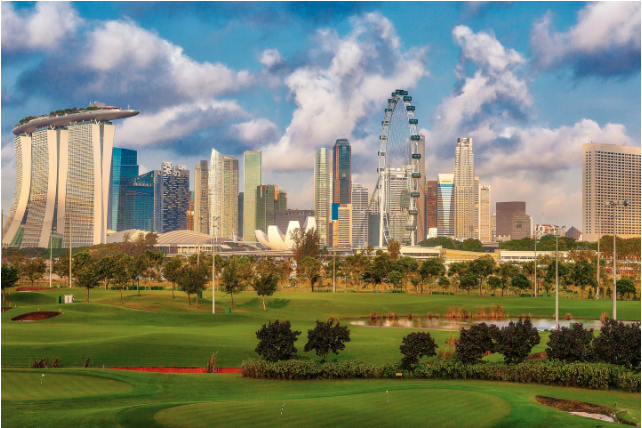 So that our cities may eventually resemble the vast urban garden that is Singapore, and that our economies become nurturing ecosystems of jobs, wealth and income for all around the planet.